A Nathan Austin hat-trick helped resurgent Caley Thistle rout the struggling Sons in their biggest win of the season. 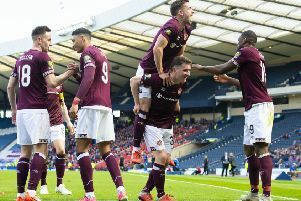 The five-goal beating kept the Highlanders closing in on the play-offs ahead of a re-match with their beaten Irn-Bru Cup final foes on Tuesday. “If someone had said we’d score five against Dumbarton I’d have been driving them to the looney bin,” beamed Inverness manager John Robertson. Home left-back Ricky Calder was left for dead by lively Sons’ wide man Andrew Stirling before his cut-back found Grant Gallacher, who fired the opener from 10 yards. The hosts levelled four minutes later through Irishman Aaron Doran’s breathtaking 25-yard shot after 17 minutes. Approaching half-time, Doran’s pass found Austin nipping around the Sons keeper to net brilliantly from a tight angle. Five minutes into the second half, Austin punished Dumbarton slackness and Iain Vigurs, from 10 yards, and then Austin with another cool finish, wrapped it up.